I was invited on a ride today. The route, around the Olympic Mountains, was selected by a friend who took the day off. As I live on the west side of Lake Washington and he lives on the “eastside”, I met up with him and his wife at a Starbucks in Renton. 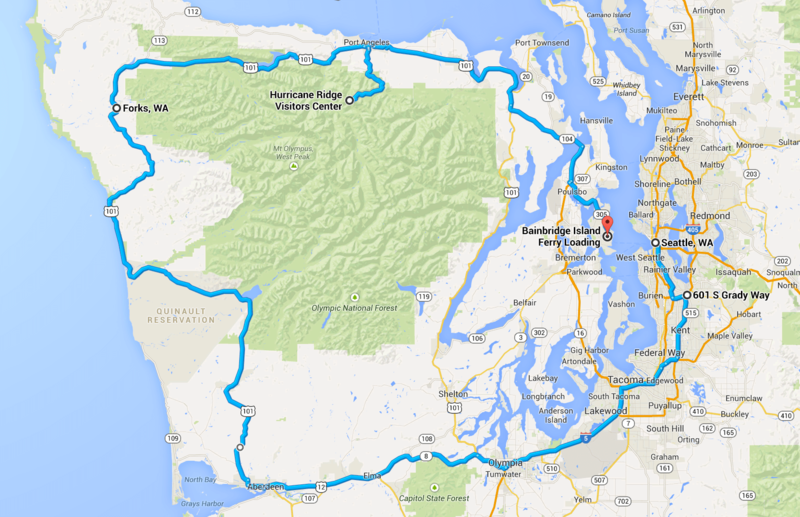 The route was south along I-5 to Olympia, then west to Aberdeen, north to Forks, and then to Port Angeles. They are preparing for a long ride to Arizona and wanted to ride through a full tank of gas without stopping – sort of a test of their comfort level on the bike. So after coffee, we took off and didn’t stop again until reaching Forks for lunch at the Mill Creek Bar and Grill. The distance was approximately 186 miles. I would have stopped for a break a bit earlier, personally, but it was an interesting experiment and useful for them. Anyway, after lunch we continued past Lake Crescent and into Port Angeles. The weather was amazing, not at all the gray skies and rain people expect to see in Seattle. For those who don’t live here, September can be one of the best months, weather-wise – not too hot and not rainy 🙂 The temperature today was in the 60’s along the coast and 70’s inland. and the gently twisting road that takes you to the top! I found a Youtube video (credit for the video goes to user RPG405) of three motorcyclists descending Hurricane Ridge Road. It was filmed on a clear day like today, but appears to be early summer in the video. In any case, you will get a sense of what all the fuss is about. I start the video playback when they pass the Visitors Center. I took the Bainbridge Island Ferry back to Seattle. This is my favorite way to finish a ride. Being on the water is relaxing for me. On a day like today, you also get a chance to take a photo of the Seattle waterfront from the Puget Sound. Looks like a great day ride, even if I’m not a biker. The view from Hurricane Ridge makes me want to visit there. It’s good to hear that the weather has been so wonderful in the Seattle area. Other than the overcast mornings, we’ve had great weather in Santa Cruz lately. Enjoyed seeing part of the video of the descent from Hurricane Ridge. Gave me a sense of the place. Nice big curves down the mountain.